Laminate floors have been popular in homes everywhere for quite some time now. People love these floors for so many reasons. They love how inexpensive they are in comparison to genuine hardwood floors. They love the fact that they appear in all kinds of attractive styles, textures and shapes as well. If you want to invest in laminate floors for your residence, though, you have to make sure that they blend in well with the rest of your interior design. These suggestions can make choosing the best laminate flooring for your home a markedly easier and more convenient task. Laminate floor styles truly run the gamut. There are laminate floors that are optimal for all kinds of preferences. It doesn't matter if you prefer interior design that's modern, fresh and chic. It doesn't matter if you prefer interior design that's enduring and timeless, either. You'll surely be able to find choices in laminate floors that strike your fancy. Your aim should be to find laminate floors that blend in seamlessly with your existing interior design elements. If you want your living space to have a cozy, friendly and inviting feel, you can go for laminate floors that are reminiscent of barn wood from decades past. If you want your living space to have a clean, streamlined and polished feel, on the other hand, you can go for floors that are significantly sleeker in style. Laminate floors are optimal for people who don't like the idea of style restrictions. That's the reason they can be terrific flooring choices for people with all kinds of tastes and needs. Your home most likely has some kind of color scheme. You may be a fan of colors that are more muted and subtle. You may be a fan of colors that are more striking and brilliant, too. If you want to select laminate floors that are a fantastic match for your residence, you need to make color a focal point. This is critical regardless of whether or not you prefer laminate floors that have wood or tile appearances. Gray, white and black laminate floors are all wildly popular options. If your residence has a dark, calm and moody ambiance, gray or black laminate floors may be optimal for you. If it has a bright and airy ambiance, white may be optimal for you. You should always take the time to carefully picture the overall look of your home. Ask yourself what colors complement it the best. That answer should point you into the right direction. You should aim for a laminate floor that has a color that brings out the best of your existing interior design components. Don't go for a laminate floor that clashes with them in any way, shape or form. Don't go for a laminate floor that doesn't do anything for them, either. Your priority should be to choose a floor that takes your interior design to a brand new level. The right flooring can do that. It isn't only vital to think about your actual laminate floor. It's also vital to think about the right coating for it. Aim to find a laminate floor coating that is reminiscent of your interior design. Aim to find a coating that gives your interior design a nice sense of harmony and cohesion. If you don't, you could end up with a room that has a rather chaotic and confusing feel. Think carefully about all of your interior design objectives as well. If you go for a finish that's on the pale and light side, it will make your room feel a lot bigger. If you go for a finish that's darker, however, it will make your room feel a lot more tranquil and comforting. These moods are total opposites. Think about your room lighting in significant detail. Is your room bright? Does it receive an abundance of natural light on a daily basis? If it does, darker flooring may contribute to more equilibrium. Selecting laminate flooring can be quite a big responsibility. Laminate floors tend to be affordable and budget-friendly. Although they're reasonably priced, they offer so many benefits. They're strong and reliable. Maintaining them well isn't at all time-consuming or stressful, either. If you want to pick laminate floors that go well with your interior design, you shouldn't go for the most inexpensive options that are in front of you. Doing so could backfire in a big way. You should always prioritize laminate floors that are of terrific quality. Laminate floors that aren't well made won't do anything positive for your home design. You should look for floors that can stand the test of time. 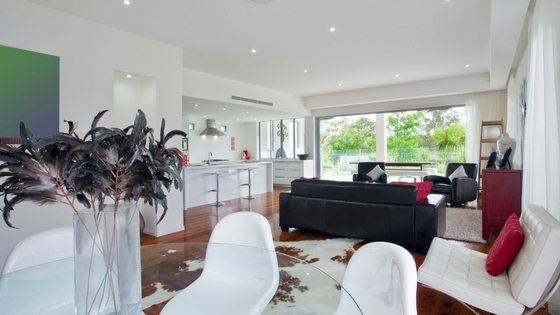 You should look for powerful floors that aren't vulnerable to scratches and imperfections. Floors that are susceptible to problems will accomplish nothing more than making the rest of your residence look somewhat shabby. Remember, quality is paramount in the laminate floor world. If you go with your gut and select a laminate floor that makes you feel confidence and full peace of mind, you should be golden! It doesn't matter if you're interested in laminate flooring installation. It doesn't matter if you want to buy A+ grey laminate flooring, either. Global Alliance Home Improvement Products Inc. can come to your rescue. We're an acclaimed flooring powerhouse that has many terrific laminate choices available to customers. We sell laminate floors in all colors. We sell laminate floors that have all types of pleasant textures as well. If you want to find laminate floors that can make the rest of your home look amazing, we can help you out. Contact Global Alliance Home Improvement Products Inc. today to learn more about our terrific options in laminate floors and beyond.